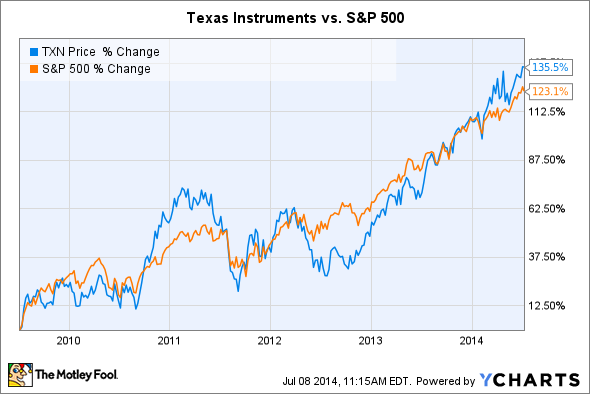 Where Will Texas Instruments' Growth Come From? Texas Instruments is well-positioned for both automotive and the huge Internet of Things trend. Texas Instruments (NASDAQ:TXN) is a $52 billion semiconductor giant that has provided investors with slightly better than market returns over the past five years. 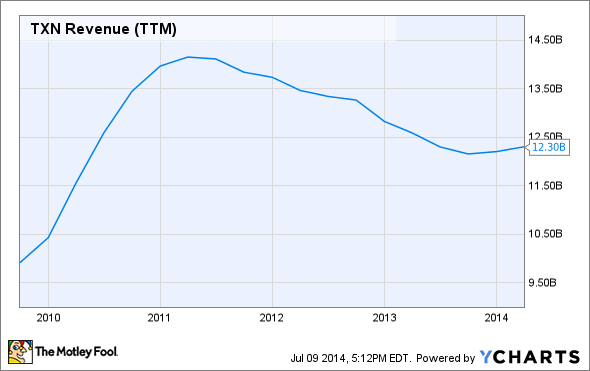 Texas Instruments' revenue growth, however, has pretty much stalled over the past few years. The company clearly needs to grow its top line, but where is it looking to for future growth? Motley Fool analyst Rex Moore was able to put that question to Kent Novak, senior vice president of DLP Products at Texas Instruments, at the recent International CES in Las Vegas. In this video, Novak notes that Texas Instruments should see opportunities in two of the biggest new trends in technology: connected cars and the connected home. Both of these growth areas are key components of the emerging Internet of Things trend. Kent Novak, senior vice president of DLP Products, Texas Instruments: We've had a traditional focus on automotive. I think that's one of the emphasis areas you see here inside this area -- really a combined solution, which is our processor solutions for infotainment, our connectivity solution which ties all that together and which give the connected car access to the outside. Then as we put that together with our display solutions so you can get a great-looking display or the right information presented at the right time. That's clearly been one of our pushes. You mentioned the Internet of Things ... having a connected or intelligent household, more intelligence inside other appliances, or the vehicle. That's going to become more and more important, and I think that fits very well into our very broad portfolio and what we can offer in that solution as well.